The Lovers is a card all about love. Not a shallow love but a very deep intense love, and one that you cannot really do without. It could be a new job, a new house, car, item, pet or person that will suddenly appear in your life, but once you have found that love you will most certainly not want him/her or it to leave. If you already have an established relationship then this card signifies that any obstacles will be overcome in your search for balance, romance and harmony within that union. 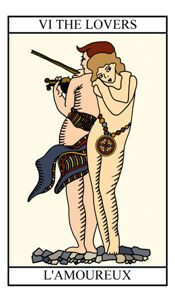 In terms of a new relationship then the Lovers card suggests that this new romantic opportunity could be a success. This card is also symbolic of something or someone entirely new entering your life. Once this event has happened, your new set of circumstances may present you with a variety of choices and ultimately may lead to you to having to choose between a series of options. Within the context of career, then this card suggests that you may have outgrown your old role or job position and if it is the appropriate time, then maybe you should move onto something new. Although the choice to be made may prove initially hard to make, this is a card of second sight and intuition and is sure to help you in your quest for true love.